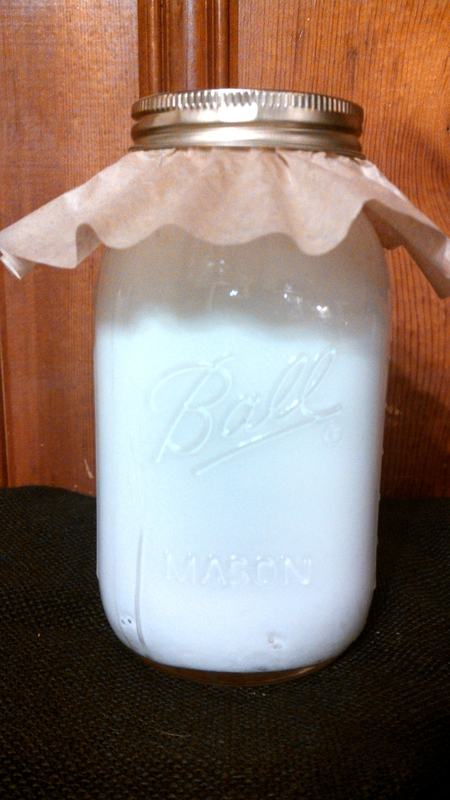 Milk Kefir… Easy to Make and Easy to Turn into Cheese! How did I not know how easy and awesome Milk Kefir was!? I have been fermenting lots of different things in the last few years and just never made it to Milk Kefir (MK). My sister sent me some starter culture in December and I am amazed at how fast and easy it is! And so yummy and good for me! Milk Kefir starter culture is referred to as grains. They are not an actual grain but a gummy blob of varying sizes. If you have used Water Kefir grains they are similar but plumper and colored white. It is actually a symbiotic relationship between healthy yeast and bacteria that creates beneficial probiotics. I have read anywhere from 30-50 different beneficial strains are in every batch you make. Compared to a dozen or less in store-bought Kefir. You can purchase the grains from a company online like Cultures for Health in a dehydrated form. Or if your lucky you can get them from someone you know who has Milk Kefir and has grains multiplying to share! The choice of milk you use is pretty broad making it doable for more families. You can use cow or goat milk, raw or pasteurized, and even coconut, soy, or rice milk! The MK grains feed on the lactose in the milk so that little to no lactose is left in the resulting Kefir beverage making it great for people who are lactose intolerant. Fat content of your milk doesn’t matter to ferment but a higher fat milk adds creaminess to finished product. Some people say you can use ultra pasteurized milk as well but the results are inconsistent. Same with nut milks. The people who say it works do recommend a rest in regular milk in between batches. Dehydrated grains do need to be re-hydrated in pasteurized milk first. All you have to do to start Milk Kefir is put 1 tsp to 1 T of grains in a quart jar and fill with milk. Cover with a breathable material, I use a coffee filter secured by a lid ring or rubber band. This allows it to breath but no dust or flies can get in. Leave at room temperature for 24 hours and let it ferment! Strain the Kefir grains out with a non-metal mesh strainer and add them to next jar and start over. Take your finished MK which will be anywhere from a buttermilk to yogurt texture and have a tangy, almost fizzy yogurt like taste! Enjoy as is or refrigerate first. You can even do a second ferment at room temperature or in fridge where you let it ferment another 24 hours for even more active probiotics. So now what do you do with all this Kefir!? Drink it as is if you like or I always stir in a spoonful of raw honey and it is irresistible! Add some to blender with frozen fruit and you have the best smoothie ever! My toddler likes it all these ways but the older teens prefer the smoothie. The flavor possibilities are endless! You can also use it in recipes in place of milk, yogurt or sour-cream. Salad dressings like ranch are said to be amazing! What we really like is Kefir cheese!!! 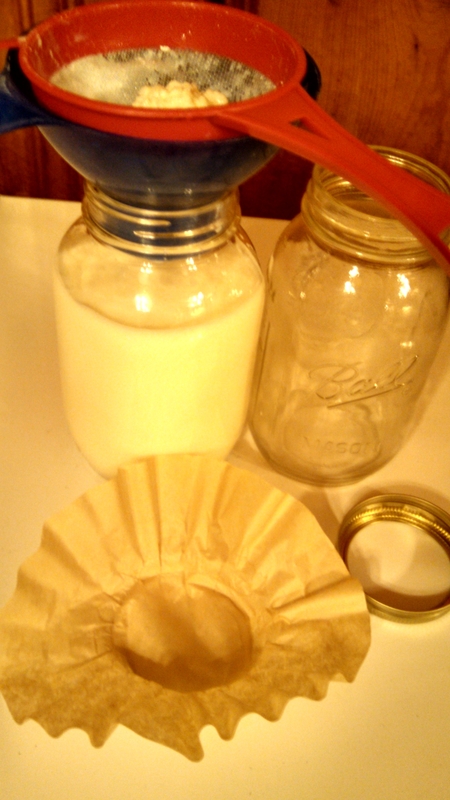 All you need is some finished Milk Kefir and a colander with cheesecloth or coffee filter set over a bowl! Line your colander with cheesecloth or coffee filter and pour the Kefir into colander. The whey will go through and curds will stay in colander, thickening as it goes. You can do this in fridge or on the counter up to 24 hours. After just a little while it has a consistency of sour cream if you want to take some off for your potatoes! Then it gets to be like cream cheese and then more of a farmers cheese the longer you drain. When it is desired consistency transfer your cheese to a container and feel free to salt or flavor with herbs! It can now be used in so many ways! The whey in the bowl can be used for lots of things like baking, is great for pets, or lacto-fermented veggies. I hope you give this beneficial treat a try and that you love it as much as we do! I have reached a point that if I haven’t had any that day I get an intense craving for it! Looks like a fun thing to try. I want to pin this, but can’t seem to. Thank you! We have a Pin it button at the bottom of every post. If you click “share” button it will open up all the options including pinning! I appreciate the interest and hope you enjoy more of my posts! Good, I’m glad! I’m a new blogger so I might change that if its hard for people to find so I am very glad you asked about it! You are so welcome! The possibilities are endless with all the uses for this cheese too!